Hi, I`m pleased to introduce "Mai" who is approx. 8" tall and is made from beautiful winter white alpaca and the most wonderful vibrant purple German mohair. She has hand shaded features, is traditionally five way cotterpin jointed with violet pawpads and English black glass eyes, She is poly/steel ball filled for a nice weight and comes to you wearing her pretty bow. Please note she is a collectors item and is therefore unsuitable for those under 14 years. I'm pleased to introduce to you, "Puddle" a very sweet and loving puppy. He is made from faux fur in winter white which has been lovingly hand shaded. He stands at approx 9" tall, and is designed to stand unaided. He is poly/ steel ball filled for a nice weight and has English black glass eyes. He has been both scissor and needle sculpted with little sculpted tootsies and is traditionally five way cotterpin jointed. Hi, I am delighted to introduce "Shortcake" a cute little bear on all fours. She is made from soft faux fur in winter white with little guard hairs and has English black glass eyes. She is poly/steel ball filled for a nice weight and is approx 3" tall and 4" long. She has been both hand shaded and scissor sculpted to enhance her sweet little face and she will come to you wearing her little enamel strawberry. Please note she is a collectors items and therefore unsuitable for those under 14 years. Hi, I would like to introduce to you, "Rousse". He is made from ginger faux fur and cream alpaca and has been delicately hand shaded. He has black glass eyes and a Perle cotton nose and stands at approx. 8 1/2" tall. He is poly/steel ball filled for a nice weight. He is traditionally five way cotterpin jointed and is both scissor and needle sculpted. He has cream cashmere pawpads and comes to you wearing his handmade ruff large antiqued bells. Please note that he is a collectors item and not suitable for those under 14 years. I'm pleased to introduce to you, "Santos", the Christmas raccoon (although he is quite happy all year round). He is made from long luxury faux fur in shades of silver and grey with winter white inserts. He stands at approx 10" tall, is poly/ steel ball filled for a nice weight and has English black glass eyes. He has been both scissor and needle sculpted with little sculpted tootsies, he has been hand shaded and is traditionally five way cotterpin jointed. Please ask if you have any questions and thanks for looking. Hi, I would like to introduce to you, "Thistletwist" is a very sweet and simple little soul. Designed and hand made by myself, he is made from light stone German mohair with black glass eyes and a Perle cotton nose, "Thistletwist" stands at approx. 8 1/2"tall and is poly/steel ball filled for a nice weight. He is traditionally five way cotterpin jointed and is both scissor and needle sculpted. He has half cashmere pawpads and comes to you wearing his large coppertone bell. Please note that he is a collectors item and not suitable for those under 14 years. Hi, please meet my latest yummy scrummy cat,"Talcum". She is designed and lovingly hand made by myself, Lynn Bowie of the award winning Madabout Bears and stands at approx 15" tall. She is made from longpile faux fur in winter white with a very subtle silver grey tip. She has a shaded perle cotton nose, stunning blue glass eyes and hand shading to her face, ears and feet and has been both scissor and needle sculpted. She is five way cotterpin jointed and poly/steel ball filled for a nice weight and has a weighted tail for "hangability". Please note she is a collectors item and unsuitable for those under 14 years. Hi, please meet "Hogan", a large soft and very heavy big boy bear. "Hogan" is made from wonderfully soft faux fur with alpaca inserts. He is approx 15" tall and is both scissor and needle sculpted to enhance his good looks. He has dark amber English glass eyes and half cashmere pawpads and has been delicately hand shaded. He is poly/steel ball filled. Please note that he is a collectors item and unsuitable for those under 14 years. Sorry, I have been adopted. Hi, Please meet "Vespucci", a very sweet bear designed and made by myself Lynn Bowie of the award winning Madabout Bears here in Scotland. "Vespucci" is made from gingery brown German mohair with a black hairs through it (hard describe) and he has sculpted pawpads. He is approx 8" tall, is five way cotterpin jointed and poly/steel ball filled for a nice weight. He has black glass eyes and a shaded perle cotton nose. He is wearing a lovely lightly wired bow a little goldtone bell. Please meet "Danbury"! "Danbury" is approx. 10 1/2" tall and is made from beautiful faux fur in winter white which has a lovely little guard hair. He has hand shaded features, is traditionally five way cotterpin jointed with dove grey cashmere pawpads and black glass eyes, He is poly/steel ball filled for a nice weight and comes to you wearing a large bow with silvertone bell. Hi, Please meet "Pinkerton", a sweet little bear designed and made by myself Lynn Bowie. "Pinkerton" is made from softest alpaca in the palest pink and he has sculpted cashmere pawpads. He is approx 8" tall, is five way cotterpin jointed and poly/steel ball filled for a nice weight. He has black glass eyes and a shaded perle cotton nose and although he is able to stand un-aided, he prefers to sit. He is wearing a lovely bow a little silvertone bell. I`m sorry, I`ve been adopted. Hi, I am delighted to introduce "Lavinia Lapin", a sweet little girlie bunny. She is made from the softest winter white alpaca, has English black glass eyes, is five way cotterpin jointed and is poly/steel shot/ filled for a nice weight. 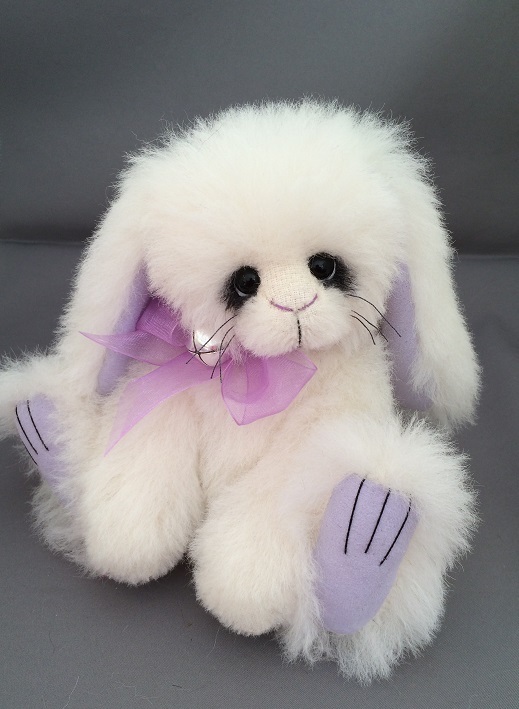 She is approx 9" tall, has soft lilac faux suede pawpads and inner ears and of course has a little white bunny tail. She is wearing a large complimentary bow and bell around her neck. Please note that she is a collectors item and is therefore unsuitable for those under 14 years. Sorry, I`m now living in Australia. Sorry, I am now living in Australia. Please meet "Shamrock", an early Saint Patricks Day offering designed and lovingly hand made by myself, Lynn Bowie of the multi award winning Madabout Bears. "Shamrock" is approx. 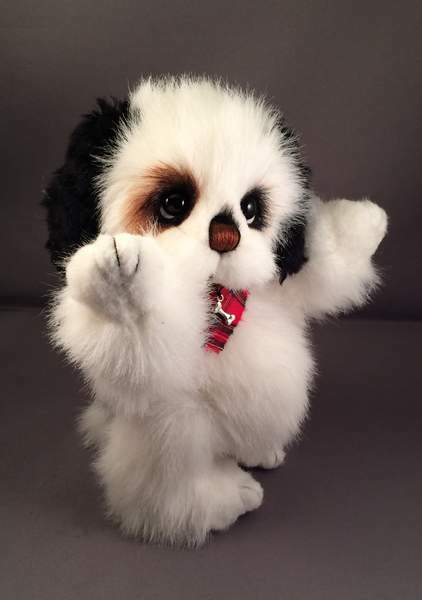 10 1/2" tall and is made from beautiful faux fur in winter white which has a lovely little guard hair. He has hand shaded features, is traditionally five way cotterpin jointed with cashmere pawpads and black glass eyes, He and is poly/steel ball filled for a nice weight and comes to you wearing a shamrock necklace over a shamrock bow. Hopefully he will also bring you the luck o` the Irish ;O) Please note he is a collectors item and is therefore unsuitable for those under 14 years, any questions, please just ask. Sorry, I`m now living in the States. Sorry, I`ve been adopted to England. Please meet my latest precious little kitten, "Freddo". He is approx 8" and is designed and lovingly hand made by myself Lynn Bowie. He is made from sparse light champagne coloured mohair, he has beautiful blue glass eyes which have been hand accented and is traditionally five way cotterpin jointed. He is poly/steel ball filled for a nice weight and the end of his tail is also weighted for "hangability". He is wearing a manly taupe bow with a little goldtone bell. Please note he is a collectors item and therefore unsuitable for those under 14 years. Please e-mail me if you have any questions and thanks for looking. Sorry, I've been adopted to Australia. Sorry, I`ve been adopted to Australia. myself, Lynn Bowie of the award winning Madabout Bears. "Rosa" is approx. 5"
collectors item and is therefore unsuitable for those under 14 years.